Apparently, a solid plurality of you (44% to be precise) hate social networking sites, judging by the poll that's been sitting on the right sidebar for the last few weeks. 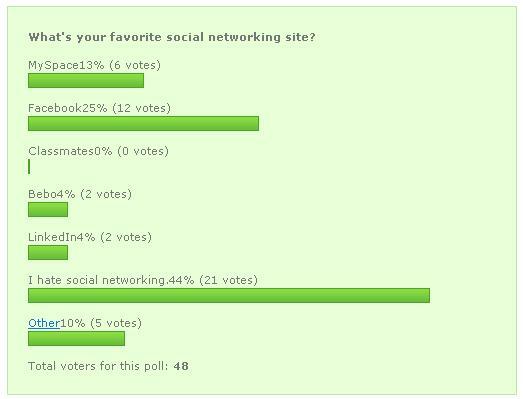 That's followed by 25% favoring Facebook, and 13% liking MySpace. Bebo and LinkedIn had some support as well. Four readers voted Other, but didn't fill in which site they liked instead, likely because the text entry field is a little hard to detect. The remaining favored Orkut. Surprisingly, there wasn't a single vote for Classmates, which Nielsen (PDF) counted among the top 10 of social networking sites back in April 2006, although the social networking space is notoriously fickle as Friendster's example showed. While the sample was small (48 votes total), it's a surprisingly good turnout given that most users of any site aren't active participants. The poll reflects some of my own qualms about social networks since the current crop don't do a good job of facilitating real relationships. If you do find social networking working well for you, it's likely despite the poor design of those sites. A term I've come across is "low emotive bandwidth", which I think sums it up really well. It's hard to communicate online via text, which is why you get people using emoticons and other ways of getting around the bandwidth problem.